Capsiplex Review - Benefits, Side Effects, Results, Does it work ? Should You Buy Capsiplex – Yes or No? People nowadays expect so much from their slimming pills – they want these to be healthy, made with natural ingredients, have as fewer side effects as possible and deliver results with consistency. Besides, they want to feel stimulated and motivated all throughout. The demands are more complex than ever. Does Capsiplex meet such exigencies? This review compiles existing research and consumer feedback, in an attempt to paint a realistic picture of the weight loss pill and its action. Capsiplex refers to capsaicin pills – a product based on natural metabolic boosters, thus being a potentially efficient weight loss agent. It is made by Advanced Health Ltd. And its main ingredient is capsaicin, the naturally occurring compound in capsicum or chilli peppers, known for firing up the blood circulation and metabolism. This is the substance that gives peppers the hot, spicy taste. The product seems to be backed by a great number of celebrities, although this is no guarantee that it actually works. All in all, it’s being marketed as a metabolism booster and appetite suppressant with a stimulating effect due to caffeine. It can burn up to 280 calories (about as much as you would have in a hamburger or in a slice of pizza) and can fight obesity in the long run. Thus, it’s not only a temporary solution or a quick fix; Capsiplex requires you to commit and see the rresults you’ve desired. According to the claims, this can burn calories “like a 25-minute jogging session”. You don’t have to do anything else in order to lose weight. Capsiplex is a very promising long term treatment for obesity and is 100% natural. It does not require you to change your eating habits, for example by creating a low-calorie meal plan. Instead, it will make you eat less on its own, naturally, as it promotes early satiety, thus getting to control hunger in excess. As it gives you a metabolic boost, your body can burn more fat than it used to. Read about the ingredients below to see more of the product’s benefits. Almost all of these increase the basal metabolic rate, to start with. Capsaicin is a well known stimulant that helps burn more calories with the same effort and within the same period of time. Therefore, it isn’t about exercising more. It’s the triggering of a natural mechanism that burns fat effortlessly, so to speak. Caffeine anhydrous can actually be more effective at weight loss than dieting. Thermogenesis is another big result of using these agents together. Additionally, the capacity for concentration and endurance increases. Unfortunately not much can be said about the amount of each ingredient since it’s not specified. Therefore, it is impossible at this point to draw a conclusion concerning the potency. In any case, each person is different and thus may need more or less of these ingredients. Therefore, anyone willing to try this can see for themselves how well it works for them. The only warning is that related to caffeine. This can increase anxiety symptoms in patients who are prone to such issue. Also, it may make one nervous, agitated, cause a dry mouth etc. If you usually don’t drink coffee, you may not respond too well. In case there’s a real sensitivity, you could have unpleasant symptoms. Drinking loads of water when taking the pill is really good advice, regardless. 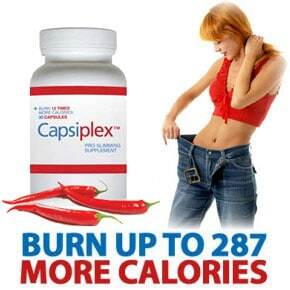 Capsiplex can stimulate the metabolism and reduce hunger. A team at the University of Oklahoma studied the effects of Capsiplex itself (not just the main ingredient) and found that subjects taking the pill burn 3 times more calories before exercise compared to those who do not take it. During physical exercise, the boost is negligible. However, what happens afterward is also very interesting: during the first post-exercise hour, the body burns 12 times more calories when on Capsiplex. These finds are astonishing. Sure, there are other slimming products that claim to keep the fat burning going on for many hours after, even well into the night, but there may not be sufficient evidence for that. With Capsiplex, these results were proven by researchers already and they’re really good news. In addition to this, it is well known that even a small quantity of chilli consumed with a meal will increase the body’s temperature, which is known as a thermogenic effect. What happens at this point is that the body then begins to work harder to regulate this mechanism and, while doing so, it expends more calories. This is a short term effect, it’s true, but when the capsaicin concentration is much higher, you can hope for much more. On top of that, the product also uses caffeine as stimulant, plus other ingredients with similar roles, all of these working towards the same goal. You know it starts to show its power when you feel your blood circulation improve. When this happens, the metabolism is also going up. What Capsiplex does is to help you increase your metabolic rate and burn away your fat deposits in a totally safe manner. Also, the body temperature rising effect is not dangerous; this isn’t about getting fever or anything like it, it’s simply generating more internal heat, like when you are exercising. Therefore, you are safe at all times when taking Capsiplex, except for when you are sensitive to caffeine. If you know you get unwanted symptoms when drinking caffeinated beverages, you should not opt for this pill. Find a stimulant-free one instead. Capsaicin can be a controversial ingredient and not everyone is convinced of its efficiency in weight loss. Still, plenty of consumers have reported that Capsiplex is a friendly product. Thanks to the special coating, the capsicum extract does not put the stomach at risk. It is liberated in the intestine, where it causes no damage. This is a very important aspect for people who cannot have too much chilli because it upsets their stomach. No more irritation due to increased acidity. Some of the customers still experienced stomach burns but discovered they felt better when taking the pill with a meal. Therefore, perhaps taking it on an empty stomach should be avoided. As a side note, no one starved themselves in the process. Many claim they felt their heart rate go up and got energized, which felt just right for exercising. Capsiplex has the right amount of caffeine that is released slowly, so it does not cause the typical crash, making you jittery first, then leaving you drained. You can expect visible results with Capsdiplex if you take it regularly for a long enough period of time. But firstly, if you feel skeptical, know that you can experiment dorectly with its main ingredient and convince yourself; it’s easy to see the action of capsaicin when you have a cold, for example. It will warm you up quickly, make your nose run and heal your sinuses. Its thermogenic effect is the quickest to show. In addition, the niacin, a vitamin from the B range, found in this supplement, has an important role in converting food into fuel (more precisely, glucose). It matters to have this water soluble vitamin on a daily basis, because it gets excreted. The formulation is a smart one and every ingredient on the list makes sense. To make it work, take only 1 capsule per day, preferably in the morning, because of its caffeine content. It is also good to take it one hour or minimum half an hour prior to exercise, to make sure you get the combined effects of both. Most people found it easy to lose their first 3 lbs. You can lose about 4lb in the first week, so results are quick to show. After that, users claim the weight loss rate decreases, but they can still lose up to 2lb per week. This is fairly motivating actually. It’s good to see some changes so quickly, when other products take several weeks to make the slightest modifications. However, this also means that the manufacturer’s claims aren’t 100% true. The approximately 280 calories to lose is not a day-to-day occurrence. Thus, you will not burn this amount on a daily basis so don’t rely on it. Expect the amount to change. Another positive aspect is that, even when you are active and burning calories, you’re not feeling hungry too quickly. Therefore this will work as an appettote suppressant, too. 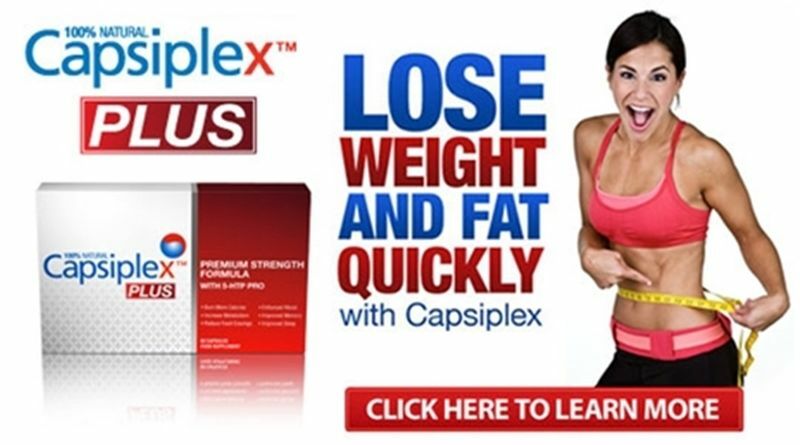 Is Capsiplex an appetite suppressant? While Capsiplex can indeed suppress the appetite, it was not designed with that in mind, but with the fat burning and metabolism accelerating goal. Are Capsiplex ingredients well researched? There is substantial evidence concerning every ingredient in this formula; each has also been extensively employed in various supplements and weight loss formulas. The Capsiplex creators do not say anything about that. It is supposed to lead to effortless weight loss but all evidence suggests that getting fewer calories, eating less fattening foods and exercising will enable superior results. I don’t like/eat hot chillies, will this product affect me? When you take capsules, you don’t feel any taste. Also, when these reach your stomach, the contents aren’t free yet – only when it reaches the intestine. Irritation s thus largely avoided and the active compounds are still doing their job weight-wise. Will I be able to exercise more? Usually, yes, because any weight loss pill containing caffeine has a stimulating, energizing effect. However, such results may vary, depending on how used you are to caffeine. Capsiplex looks promising and it appears to be a product aimed at those who do not wish to exercise, to become active or to control their portions. It works on the appetite, the energy, the blood circulation and the metabolic rate. However, chillies extract isn’t exactly a magic ingredient, nor is it the most potent one around. Therefore, while it may help you slim down, it will not deliver spectacular results on its own. You should watch your diet, of course, but never starve yourself. Note that you will still be snacking, but you can choose better foods, such as yogurt, fruit, low fat cheese, nuts etc. Therefore, it’s not necessarily the calorie count that must change, but the quality of the food you eat. Letting go of junk foods will make the greatest difference and especially exercising. The weight does not return, which is great news. You should experiment with this product and see how it turns out to be the best way for you to take it. The ingredient profile of Capsiplex is not exactly a novelty because chilli extract is present in countless slimming pills. The difference is in the technology – these pills have a special coating that protects their content from the harsh acids in the stomach. Thus, the compounds stay intact and get absorbed the right way, at the right time. The product in itself does not do much else besides what as mentioned: it doesn’t improve the mood or have any other effect besides those that were described above. Thus, it may not motivate you at all to make some inspired changes in your life, changes which could lead to substantial weight loss. It is a bit expensive and thus you may feel tempted to give up on it sooner and sabotage your efforts. All in all, its action is backed by preliminary clinical trial and makes it worthwhile. This is a safe product, but it does not necessarily make you eat less. Note that it will not lower your intake of carbohydrates, it cannot work so selectively, so if you’re prone to eating loads of these, you are at risk of keeping an unhealthy weight in spite of the treatment.